The following photos taken at our Dominican Korimako Centre show some of the varying aspects of our ministry here in Invercargill. In March 2011, a Māori health worker invited young parents to a workshop where they were shown how to create a small raised garden, make a bucket garden of herbs and greens to keep handy to their kitchen and also how to preserve fruit and make relish.. It was great to see them work with their children in filling their bucket with soil then choosing the plants as well as depart with a jar of preserves or relish. The paddock behind the house is still being developed where we plant natives, develop the fruit trees, shelter belts, community garden and wet area. 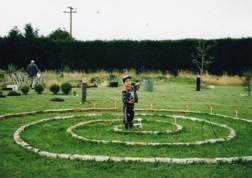 The Cosmic Walk is also situated here and one can read the Universe Story whilst walking reflectively through the unfolding spiral as this wee lad is in the photo. Outside the spiral, four posts facing the four directions ESNW have a hawk, tuatara, kiwi and whale on the top used as a teaching resource on each creature’s different gift for our reflection. In March 2011, a Māori health worker invited young parents to a workshop where they were shown how to create a small raised garden, make a bucket garden of herbs and greens to keep handy to their kitchen and also how to preserve fruit and make relish. It was great to see them work with their children in filling their bucket with soil then choosing the plants as well as depart with a jar of preserves or relish. 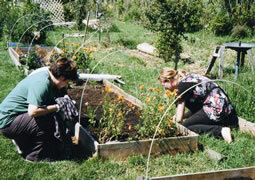 In 2010 the Community Care Trust accepted some of the covered raised gardens to teach their clients (disabled adults) how to garden. They have come in small groups with a tutor and we work with them in seed sewing, planting, weeding and composting and finally having the joy of sending them off with their own tended produce. They also helped in an autumn working bee which set the Sanctuary up for the Winter. 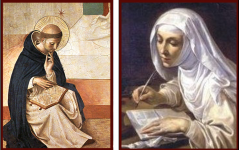 At the end of 2011 a small country Catholic Primary School sent their senior students for a half day retreat. They have been coming for the past five years. Prayer stations are set up around the Peace Garden for the young ones to experience silent reflection. Later they are encouraged to use the Cosmic Walk. 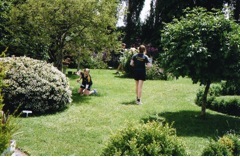 The Peace Garden may be used by groups or individuals for reflection times as well as the use of the Cosmic Walk situated in the Sanctuary.